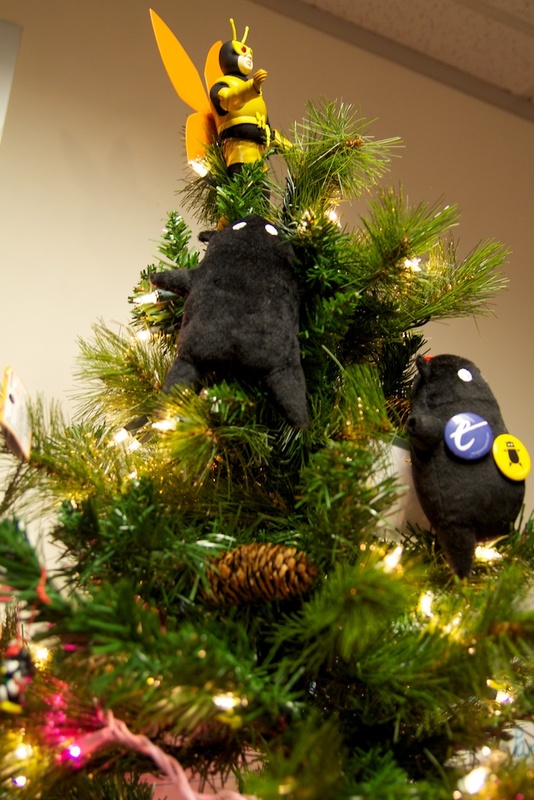 When we put up our holiday tree, we didn't have any ornaments. So we decided to make it as nerdy as possible. 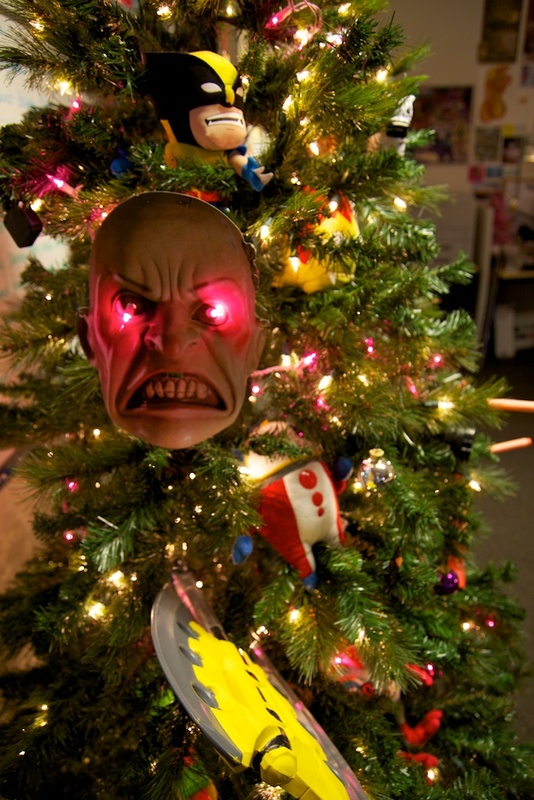 We here at The Escapist's home base in Durham, NC, are all getting into the holiday spirit. We're even going to have a holiday bake-off this week full of delicious diabetes-inducing treats! A zebra and Smithers from The Simpsons may look nice, but there's also somebody in the tree wearing those Modern Warfare 2 night-vision goggles. Oh no, he's staring RIGHT AT YOU! What better star replacement could there be than the Monarch's henchman? Also, boy and girl Zero Punctuation imps. 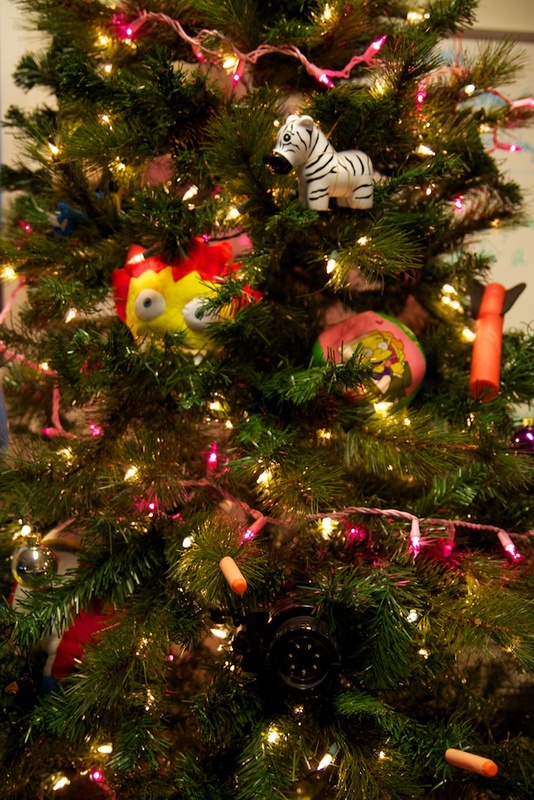 My Little Pony, fuzzy dice, Nerf weaponry - can you spot the well-hidden Murloc? The holiday tree in its full glory. Dwayne "The Rock" Johnson seen to the right. So naturally, we decided to put up a nice holiday tree in the middle of our office. Moments later, we discovered in horror that we had forgotten one of the most crucial parts of such a tree - we had no tree ornaments! Though we managed to scavenge some ornaments from our local cardboard cutout of Dwayne "The Rock" Johnson, it was a lonely and plain tree indeed. But we didn't let that stop us. 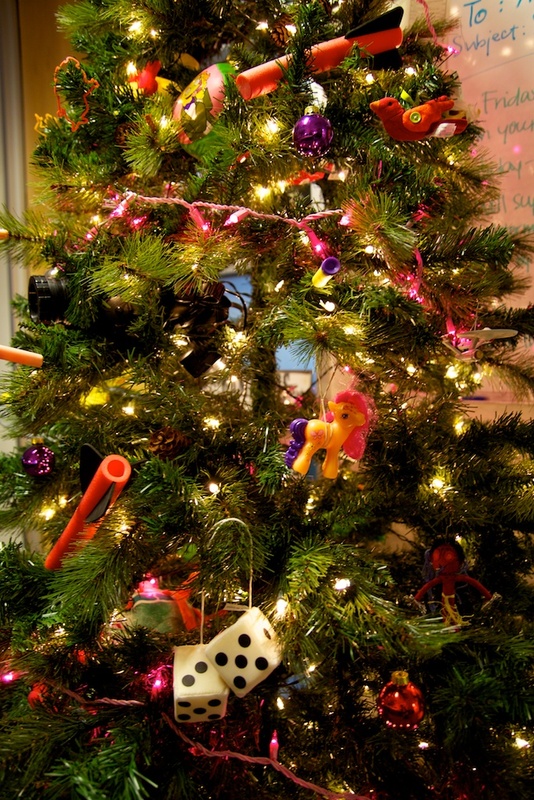 The entire office chipped in with its nerdy dolls and decorations to make this holiday tree the nerdiest holiday tree you'll see all year - until we do it next year, anyway. Click through our gallery to see all the goodies! And no, I didn't put any of my Gundam models on there. Sadly, they're much too heavy.